As the world changes, this map will change too. So be sure to check back regularly to obtain your latest copy. Accurate, layered, objects named, all countries selectable. Grab your copy by subscribing to our newsletter. 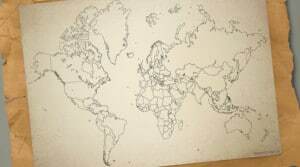 Our free vector world map in Oldline style has been drawn in a Mercator projection centered on Europe-Africa. The map is up-to-date andaccurate. As with all our maps, when the world changes, this map will change too, so check back regularly to obtain your latest copy. Above you can see some samples with results that can easily be achieved with this map. It’s that easy because you get several file formats, everything is layered, objects are separately selectable and every country is named in the layers palette. Be sure to try out our color palette from our map style Lucid. These colors play well in different map scenarios and can, of course, be used to give your free world map another look. The ‘palette’ itself is not a real Adobe Illustrator color palette, but instead it is a set of Illustrator graphic styles. The easiest way to work with them is to open up the file in Adobe Illustrator. Copy the objects on the artboard to the document you are working with. As soon as you have done that, the graphic styles will appear in the graphic styles palette of your document. Just select the object you want to give a color and click on the graphic style of your choice.